I finished my Sideways Grande Cloche today and I absolutely LOVE it! Turns out 2nd time's the charm, as my first try came out way too tall for my head even though I followed pattern instructions. My modifications were casting on 33 sts instead of 42(!) as the pattern originally called for, and 1/2 inch wider in circumference which worked out perfectly. The yarn used is Valley Yarns Berkshire Bulky from Yarn.com. It's a wool/alpaca blend which is super warm and cozy! It's also very ""bouncy"" in feel and knits up nice and fast. The dark teal color looks great and classy. I can't wait to wear it out! This is my first finished project from Boutique Knits. It's my favorite knitting book at the moment, there are so many projects I want to try! I'm still working on the Bamboo Diamond Shell, but it's temporarily hibernating as I am into more wintery knits right now. I just got a nice shipment of yarn from Jimmy Bean's Wool and will be working on Nimbus next. I'll be using Berroco Peruvia Quick, super-bulky weight yarn, so it should (hopefully) be another fast & fun knit. I'm still waiting for yarn from WEBS to arrive so I can start on the Owls sweater! Ahh, finally finished my first pair of Fetching. It's a fun, quick and easy project, I don't know why I didn't start sooner! 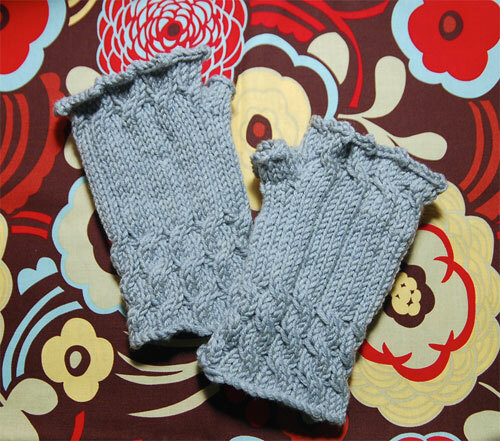 So this pair was done following the pattern exactly, in Debbie Bliss Rialto Aran with size 6 DPNs, and it's perfect for medium-size hands. I have really small hands, so I decided to give away this pair as a white elephant gift at work - my friend Meggie ended up with them, yay! She is also a knitter and blue is her favorite color! I'm so glad the gloves went to someone who will appreciate them. I still wanted a pair for myself, so I used the one skein of Debbie Bliss Rialto DK I had in my stash and knitted them up on size 5 needles. Perfect for my small hands! I don't know how many years Knitty's Fetching by Cheryl Niamath has been in my queue. 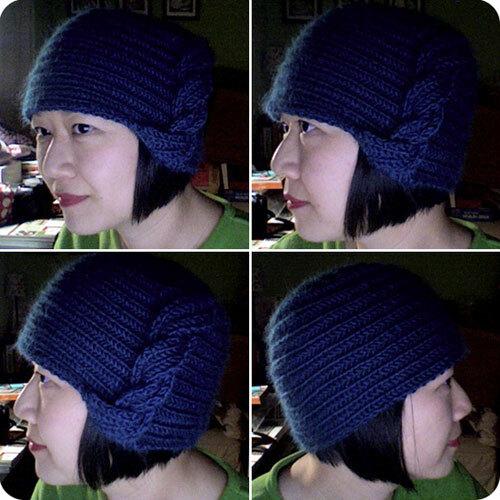 It's one of the most popular patterns on Ravelry with 16394 projects and always increasing in numbers! I finally got the chance to start it this weekend while watching the Harry Potter marathon on TV and now I see why it's so popular. It's a quick yet satisfying projects knitted in the round, with lots of fun working cables, and perfect for an advanced-beginner like me. It calls for the lovely Debbie Bliss Cashmerino Aran which I didn't have on hand, BUT - I did have Debbie Bliss Rialto Aran which was just as nice to work with. 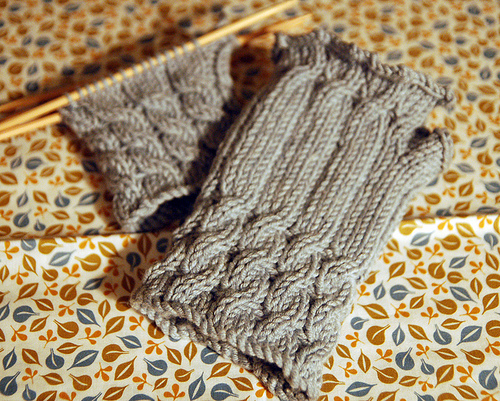 I am one of those people whose hands always get cold, so my first practice pair will be for me - it's perfect for the winter season. I will definitely be knitting a few more as gifts!